I was connecting via console to one of my VMs when I noticed that the console was not connecting and was returning an error. I went in to check the host events and I noticed loads of errors, one every a few seconds, regarding the vpxuser’s login. I wasn’t alerted as the ESXi host isn’t in production yet, so wasn’t monitored. The error I saw in the events, once I connected to the ESXi host itself was: Cannot login vpxuser@127.0.0.1. From vCenter instead I was seeing another error stating “Cannot synchronize host ESXiHost.itdtroplets.com. Cannot complete login due to an incorrect username or password. There are a couple of things you may try, start with the first one as it’s simpler. A reboot did not work for me. In vCenter, disconnect the host by right click on it and selecting Connection > Disconnect. Note that the host might already be disconnected. Now connect to the ESXi host via the Console and press F2 to enter the System Customization. Access the Troubleshooting Options menu. Go back in vCenter, right click on the host and select Connection > Connect. This might ask you to specify again the username and password to use to connect to the host and throughout the Wizard you’ll see the host summary and its VMs. Connect to the ESXi host with the vSphere Client. Right click on vpxuser and select Remove. Confirm when prompt to remove the user. This step will also re-create the vpxuser. Should this step fail, try one more time to restart the management agents and to connect. There was an issue whilst trying to install a new VMware ESXi host on a DELL PowerEdge R630 remotely (from iDRAC): The remote keyboard was not working from iDrac after booting into the ESXi installation but it did work correctly in the BIOS. Basically the installation was waiting for somebody to press Enter to continue which didn’t work. A few steps were tried to resolve the issue but in this specific case the problem was finally solved once USB 3.0 was disabled from the Bios! Specifically to this server’s bios version it’s in System Bios > Integrated devices > USB 3.0 Settings > Disabled. Upgraded all devices’ firmware to the latest versions. Get in the BIOS>integrated device, disable the Memory Mapped I/O above 4GB option [This was suggested by DELL Support]. 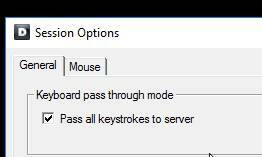 Checked iDRAC’s session options to Pass all keystrokes to server. Changed from Java to HTML5 in the iDRAC console settings.